Operating cash flow is the cash generated by an insurance company prior to the inclusion of investment income generated by managed assets. Under insurance statutory accounting rules, this is profits generated after deducting operating expenses. Insurers that have issued participating policies can cover planned dividend payments with operating cash and/or investment income. We look at operating cash as a secondary indicator of insurer operating health. I say secondary because it commonly affects policy performance far less significantly than investment performance on managed assets. The rate of change becomes even more important in situations where significant variations in scale are present. For example, if the raw average change in cash flow at company is A is $18,000 per year and at company B $175,000 per year, which company is doing better? We don’t know unless we have some idea of the usual cash flow and size of each company. Using the rate of change as a percentage we can control variance in company scale to more cleanly and meaningfully compare results. This system isn’t perfect. It will tend to overstate performance that is smaller in scale and largely ignore what could be impressive results from a rather large company–more on this after the results. 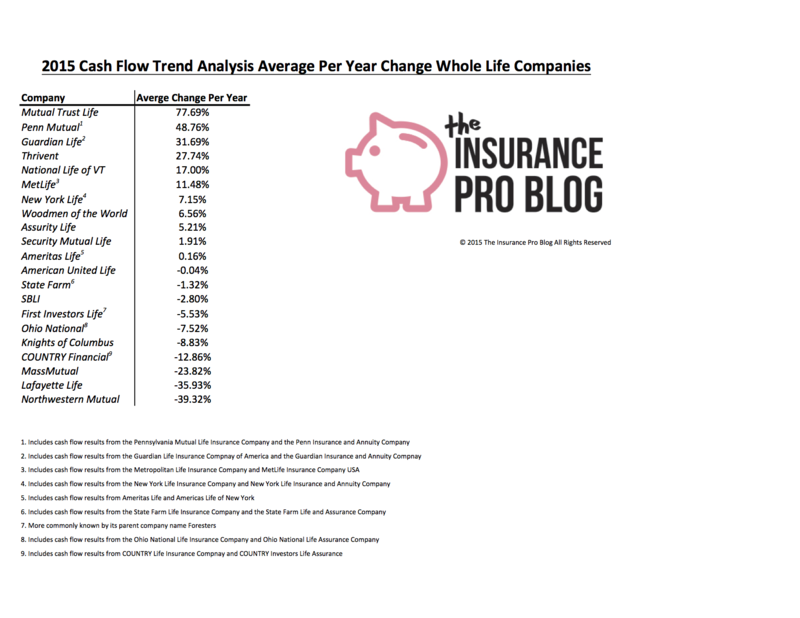 We took the five year cash flow results reported by each insurer in their statutory filings and calculated a regression line given these results. We then calculated the resulting average rate of change for each company. 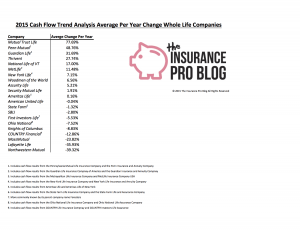 This gives us a rough idea of the average annual rate of change in operating cash flow across insurers. It’s interesting to see the variance in operating cash flow across companies of varying sizes. There’s also some caution that comes along with this. While the results reported from Mutual Trust Life and Penn Mutual look impressive, it’s important to note that both companies had extremely small operating cash flow that has grown to a more respectable level in the last couple of years. More impressive results here come from MetLife, Guardian Life, and New York Life. MetLife deserves considerable praise for it’s sheer size. It’s the largest US life insurer and generates a few billion dollars in cash flow every year. To achieve continued growth at this size is extremely noteworthy. However, given the nature of this review and its predictive nature to future performance of cash value life insurance policies, it’s also important to note that this product line makes up a much smaller piece of the overall pie of regular business at MetLife. Guardian Life’s results come mostly from a huge increase in operating cash as of last year. If not for this occurrence, the company would not stand out quite as much. The increase was substantial, however, increasing nearly 200% over the average of the four years prior. It will be interesting to see what develops over the next several years. New York Life also deserves praise being a large insurer with operating cash flow averaging over a billion dollars per year. The company has commonly held a strong reputation for its ability to generate substantial profits and it’s generally the most profitable mutual life insurer in the United States. There are also some notable laggards among the group. Lafayette Life, Northwestern Mutual, MassMutual, and COUNTRY Financial all average double digit percentage losses. Lafayette Life is probably the least impressive from the data. Lafayette’s fall comes from a company that didn’t have substantial cash flow to begin with and has fallen into some deeper negative cash flow years. Not necessarily a problem, but this is also a company that has been a laggard in terms of investment performance as well. Northwestern Mutual’s decline in cash flow is also quite substantial. Northwestern has also not shown extremely impressive investment result trends. Still, Northwestern is a gigantic life insurer and these results are less troubling than for a very small insurer like Lafayette Life. MassMutual’s decline in cash flow is likely heavily influenced by its acquisition in old annuity business from the Hartford. The company realized pretty sizable losses following the reinsuring of this business. It’s important to note that this was mostly planned. Future performance here will also be worth noting. COUNTRY Financial experienced what seems like a regression to their mean as the company’s cash flow has been largely the same following a substantial decline from 2010 to 2011. Despite the lackluster-appearing performance, there’s really nothing all that noteworthy here. As we often say no one data point can or should lead anyone to make any substantive decision about an insurer. There are several metrics to review and a degree of nuance need be considered before making more equative decisions about a company. It’s also particularly important to remember that statutory cash flow can omit significant company objectives and considerations like investment performance as well as subsidiary cash flow, which can heavily affect company direction. Still this data is important as a piece of the complex puzzle of insurance company review.